What's the coolest other thing an automaker built? Throughout the history of the automobile, car companies have often diversified their corporate interests to weather downturns in their primary industry. GM, for example, merged lots of stuff into its Delco Electronics subsidiary. What's the coolest other thing an automaker built? Nerd alert. For my money, it's the Philco 2000 Model 212 computer. Introduced in 1962, just under a year after Ford purchased the electronics firm (renaming it Philco-Ford), the 212 cost $1.65 million, with an additional $3,800 charge per month for maintenance. It came with 32K in memory, but adding an extra 32K cost an extra $1.3 million. Oh, and the printer was $160,000, and it wasn't a laser. 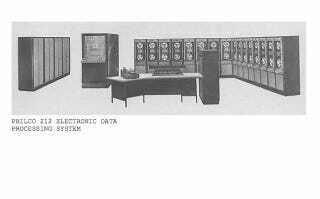 Despite the cost, the US government bought three Philco 2000 Model 212s for NORAD to use at the Cheyenne Mountain Operations Center. That is, until it was replaced by WOPR in the early 1980s.